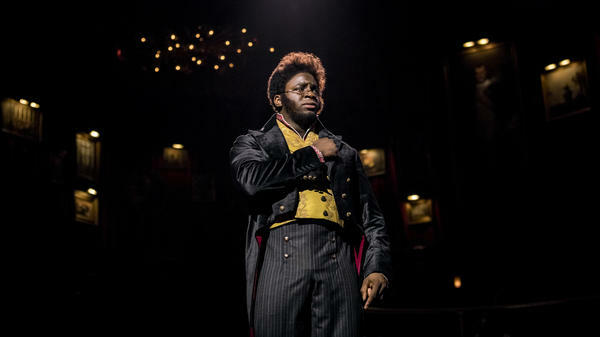 Okieriete Onaodowan had to learn both accordion and piano to play the role of Pierre in Natasha, Pierre and The Great Comet of 1812. He ends his run on the show in mid-August. The Great Comet is based on the Russian novel War and Peace by Leo Tolstoy. It received rave reviews and 12 Tony Award nominations, including one for its male lead, recording star Josh Groban, and one for its female lead, Broadway newcomer Denée Benton. Benton is African-American, and nearly half of the cast is nonwhite, a fact the show was praised for. Groban is a big star, and he sold a lot of tickets — on average the show made about $1 million a week. But, as often happens on Broadway, he never planned to play the drunk and depressed Pierre forever. In early July, Groban ended his run; his replacement was Okieriete Onaodowan, an African-American actor from the original cast of Hamilton. When NPR interviewed Onaodowan in May, he was thrilled to join the show. "It's important to see yourself represented," he said, "and this is such a diverse cast ... even the voices, all the voices are completely different." But ticket sales dropped during Onaodowan's run as Pierre. To boost the box office, the show's producers invited Tony and Emmy Award-winning actor Mandy Patinkin to take the part. Patinkin had seen The Great Comet both on and off Broadway, and he was a fan. But the decision to replace a black actor with a white one lead to a Twitter storm. The website Broadway Black wrote that "the abrupt replacement of [Onaodowan's] role to boost ticket sales raises questions about how Black actors are valued and supported within Broadway." Broadway Black editor Andrew Shade says it was disrespectful to Onaodowan, and all too common. "People of color in the community don't want to get the short end of the stick; they don't want to get the crumbs. And that's what it sort of feels like at the moment." On Twitter, Tony Award-winning actress Cynthia Erivo called the decision "distasteful and uncouth." Patinkin responded to the criticism by cancelling his Great Comet run. And then there was a backlash to the backlash: Great Comet fans and cast members took to social media to defend the show. In an open letter, cast member Azudi Onyejekwe wrote that, while mistakes were made, he found the show's white creators to have a "thorough, nuanced, pragmatic approach to diversity." Diep Tran covered the controversy for American Theatre Magazine. She says, "The fans of the show rightfully pointed out: This show is the most diverse on Broadway, so why are you making it a target?" In the end, Tran says, The Great Comet both proved and disproved some of the misconceptions about what is commercially viable on Broadway. "There is still that bias that only white voices can make money. That show was very diverse, but at the same time that show also had a white lead as its selling point." And Josh Groban was a very hard act to follow. Some people hoped that the show "Natasha, Pierre And The Great Comet Of 1812" would be the next Hamilton, a musical that invigorates Broadway, attracts young, diverse audiences and employs a multiracial cast. Instead it's closing, in part because of a controversy over casting and race. NPR's Elizabeth Blair reports. ELIZABETH BLAIR, BYLINE: "The Great Comet" is based on the Russian novel "War And Peace." UNIDENTIFIED ACTOR: (As character, speaking Russian). UNIDENTIFIED ACTORS #1: (As characters, singing) And this is all in your program. You are at the opera. Going to have to study up a little bit if you want to keep with the plot. JOSH GROBAN: (As Pierre Bezukhov) There's a war going on out there somewhere and Andrey isn't here. BLAIR: ...And for the show's female lead, Denee Benton. DENEE BENTON: (As Natasha Rostova) Andrey, where are you? I want him now, at once, to embrace him and cling to him. No one can understand. BLAIR: Benton is African-American. Something else the show was praised for - a multiracial cast. Nearly half of the actors in "The Great Comet" are nonwhite. The backlash started when Josh Groban ended his run playing the drunk and depressed Pierre. UNIDENTIFIED ACTORS #2: (As characters, singing) What about Pierre? Dear, bewildered and awkward Pierre? BLAIR: Josh Groban is a big star. He sold a lot of tickets. On average, the show made about a million dollars a week. But as often happens on Broadway, he never planned to play the part forever. His replacement was Okieriete Onaodowan, an African-American actor from the original cast of "Hamilton." When I interviewed Onaodowan in May, he said he was thrilled to join the show. OKIERIETE ONAODOWAN: It's important to see yourself represented. And this is such a diverse cast. And the kinds of people - even the voices, all the voices, are completely different. BLAIR: Ticket sales dropped during Onaodowan's run as Pierre. To boost the box office, the show's producers invited Mandy Patinkin to take the part. The Tony- and Emmy-winning actor had seen "The Great Comet" both on and off Broadway. He told NBC's "The Today Show" he was a fan. BLAIR: But the decision to replace a black actor with a white one led to a Twitter storm. The website Broadway Black wrote that Onaodowan's abrupt replacement raises questions about how black actors are valued and supported within Broadway. Broadway Black editor Andrew Shade says it was disrespectful to Onaodowan and all too common. ANDREW SHADE: People of color in the community don't want to get the short end of the stick, or they don't want to get the crumbs. And that's what it sort of feels like at the moment. BLAIR: Tony-winning actress Cynthia Erivo called the decision distasteful and uncouth. Responding to the criticism, Patinkin canceled his appearance. Then there was a backlash to the backlash. "Great Comet" fans and cast members took to social media to defend the show. In an open letter, cast member Azudi Onyejekwe wrote that while mistakes were made, he found the show's white creators to have a, quote, "thorough, nuanced, pragmatic approach to diversity." Diep Tran covered the controversy for American Theatre magazine. DIEP TRAN: The fans of the show rightfully pointed out this show is the most diverse on Broadway. So why are - why are you making it a target? BLAIR: Tran says in the end, "The Great Comet" both proved and disproved some of the misconceptions about what is commercially viable on Broadway. TRAN: There is still that bias that only white voices can make money. That show is very diverse. But at the same time, that show also had a white lead. BLAIR: Josh Groban - a very hard act to follow. Elizabeth Blair, NPR News. UNIDENTIFIED ACTORS #3: (As characters, singing) Hey, hey, ho, Balaga. Hey, hey, Balaga, the famous troika driver. Hey, Balaga. Ho, Balaga. Hey, hey, hey, Balaga. Hey, hey, Balaga, the famous troika driver. PAUL PINTO: (As Balaga, singing) Who's that madman flying... Transcript provided by NPR, Copyright NPR.